Learn what to do when you need to give a refund to one of your customers or enter a refund for something you have purchased. Note: Do you know the difference between a refund and a credit. A refund is immediately returning money to a customer or being given money from a vendor. A credit is where the money is saved as a "credit" that can later be applied against (or deducted from) a customer's invoice or a vendor's bill. You handle a refund by creating a negative invoice or negative expense. Let's take an example of giving a partial refund of $10 on a $100 invoice. To create the refund, go the Income page. Next, find the customer invoice in the transaction history list on the income page and right-click it. This will pop up the option to Refund. Clicking on Refund will create a refund invoice. All you need to do is enter the Date and adjust the Amount (if it is a partial refund). In our example, we are giving a partial refund of $10, so we change the $-100 invoice to $-10. Here's an example of manually creating a $10 refund for the invoice. First you go to the Income page. 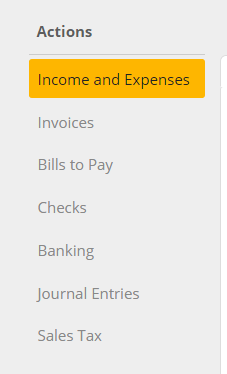 Then create a negative invoice for the customer in the Enter Income tab. Terms or Payment Account: This is where you choose which account to use to pay the customer back. For example, if you paid the customer back using funds from your bank account, you'd choose bank account. Income Account: You choose the same account that was used on the original invoice. Price: Make sure to enter in the amount as a negative since it's a refund. For example, $-10. Sales Tax: If you charged Sales Tax on the original invoice, use that same sales tax code. If you are looking to process a refund for something you’ve purchased from a vendor, you would follow the exact same steps, but use the Enter Expense tab instead of the Enter Income tab.